AVSIG: Sig III is Now Boarding! So, are we going to have the Triskadecanno Last Message Contest? 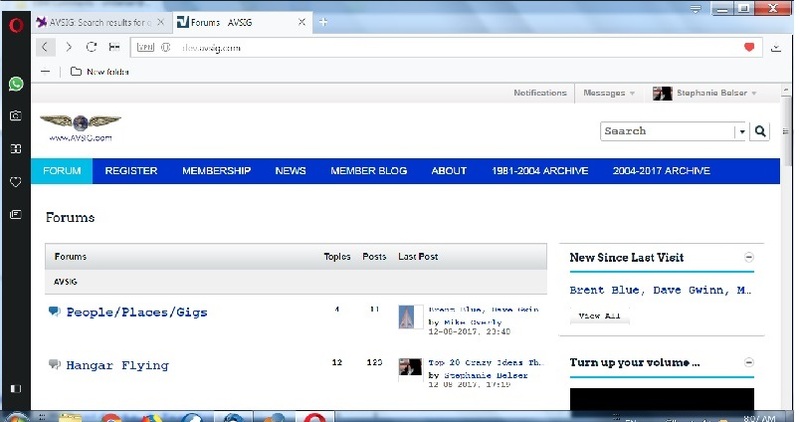 But one interesting thing, if you make the window wider, the actual forum section does not get wider, the blue borders get bigger. Right now, the New Since Last Visit is very narrow, so you cannot really see the useful words. Might that be a function of screen resolution? It looks ok on mr laptop. For any issues with Sig-III, I, for one, will be happy to no longer have to go through this super-klugy method of adding pictures to my posts. There is a “View All” button located at the bottom of the “New Since Last Visit”. Press that and it fills the screen with all the new stuff. That’s how I start every new visit.